This tunnel tree's massive base is no less impressive now that it lies on the forest floor. 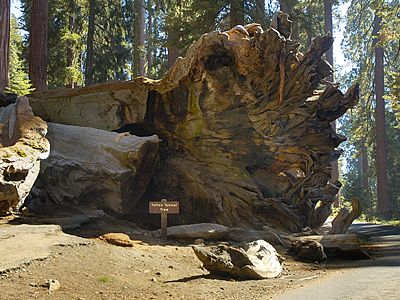 With a base diameter of 26 feet, the sequoia supported a tunnel that was seven feet wide and nine feet high for 88 years before severe weather and the tunnel brought it down. Click and drag within the 360° images to navigate.